The following is dedicated to dogs and dog-lovers everywhere. While this column is about one dog, it’s quite apparent that most owners feel the same way about their dogs. 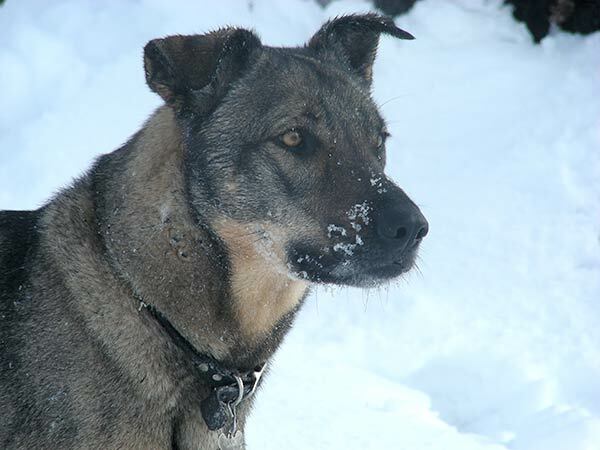 Molly was a 50-pound shepherd mix — though one vet said she looked like a Czechoslovakian wolfdog — that I was privileged to spend 15 years with. She came to me from the Bend Humane Society when she was six months old. She died on February 28 of many things common to old dogs. But, thankfully, she was active until her final few days. And she never complained. You left me too suddenly and quickly. I know I’m supposed to be grateful for that. Grateful that you and I were spared the pain and suffering of a long, protracted illness. Grateful that it came on without warning and lasted only a few short days. Grateful that you died on your own and I did not have to make that dreaded decision. Grateful that you were active until those last few days — even though your old bones creaked and your muscles ached. Grateful that you were around for 15 glorious years. While I am grateful for all those things, I still can’t help but feel cheated. Cheated that I did not get a chance to say a proper goodbye and tell you all that you meant to me while you were fully aware — that I only got to do that after you lapsed into semi-consciousness and labored breathing, it finally dawning on me that the end was near. Cheated that I did not fully realize how sick you were and treated you more gently and compassionately in your last few days. Cheated that my primary concern seemed to be to get you to go outside and go for a walk to do your business rather than to let you lie there and be comfortable. I did not realize how empty and cold the house would be without you and how I would automatically start to reach for your food dish and your water dish and your leash — and then catch myself, realizing you were not there to eat or drink or go on a walk. Or there for me to see you lying on the carpet, warmed by that little spot of sunshine that you always seemed to find. Following that spot as it worked its way across the room. Both of us taking comfort from that simple little pleasure. I’m not sure which of us was more warmed by that little spot of sun. I will also miss all the other simple little pleasures. Like coming home or waking up to your greeting. Or hiking thru the wilderness while you did your hunter thing. Or wondering if you found some dietary indiscretion in the woods that you and I would pay for after your digestive system did its thing. Or looking in the rear-view mirror to see your focused gaze and coiled body as you tried to spot chipmunks scurrying across forest roads. We did spend many glorious hours in the woods, didn’t we? In short, I will miss the comfort of your presence and all those thousand little things you did that brought both of us such joy, whether you were sedentary or at full gallop. If only people could learn your unconditional love and forgiving nature. Besides the basic necessities of eating, drinking, peeing, pooping, and chasing, the thing you wanted most was to be with me. To go where I went and do what I did. On those few times when I made you stay home by yourself — and there were more of those as you got older — you, of course, sulked. But, when I got home, you forgave me as if it had never happened. All I had to do to get you to wag your tail was walk into a room or talk to you. Even when I scolded you, you forgave me. You seemed to know that I was only doing it for your safety — and so I could get my deposit back. What’s the use? Words cannot begin to express how I feel about you and how much I will miss you. I hope my actions during your earthly days spoke louder than these words. Just know that looking at you made me smile. Your joy in the little things taught me perspective. Your presence gave me comfort. I made a poor attempt to tell you how I felt every day of your life. I leave you now with my nightly good night wishes. And now you truly are having the best sleep ever. I know of what you write, Tom Donahue. My sadness and happiness are for you and your Molly dog. This comment has been hidden due to low approval.